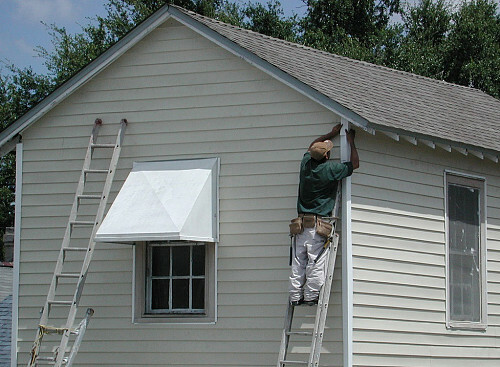 Vinyl siding can greatly enhance the look of your home and increase its value. Vinyl, made from polyvinyl chloride (PVC), first became popular in the 1960s. Today vinyl is the leading material used for siding in the US because of its durability, easy maintenance, and low cost. The cost of vinyl siding for your home will vary greatly depending on the grain and thickness you choose. While initial costs may exceed those of other types of siding, in the long run vinyl will save you money. Aside from its low maintenance needs and longevity, vinyl siding also serves as an extra insulator for your home. In cold-winter cities like Chicago, the extra insulation can greatly reduce heating costs. Professionally-installed vinyl siding typically ranges $2–$7 per square foot, depending on the quality and thickness of the siding. The thickness ranges from .035 to .055 inches, with most premium brands offering between .040 to .048 inches. Thicker siding will last longer but cost more. Can I Install Vinyl Siding Myself? Though you can install vinyl siding yourself and save money, there are many considerations that need to be taken into account, including the style, size, how loosely to install the panels – factors that require professional experience. If your home has outdoor light fixtures, vents, or sharp angles, the panels will need to be custom cut to accommodate these irregularities. The climate you live in is also a consideration, since gaps may need to be left to accommodate the shifting and expanding of the panels as the weather changes. In extremely high winds, vinyl siding can become cracked or broken and a local contractor may need to be called to repair the siding. A repair typically costs between $150 and $300 depending on the extent of the damage. Vinyl siding repair will be simpler if you have kept some leftover pieces from the original installation. What Kind of Vinyl Siding Should I Choose? Vinyl siding can mimic the look of wood and other textures, and comes in over 400 colors. It’s also long-lasting and much less inexpensive than wood. Consult with a roofing contractor to determine the right thickness, style and color for your home. A UV coating to your siding will add to the life of the siding by protecting against fading and other sun damage, but costs more. You can also install vinyl siding on your garage if it’s a separate unit, and possibly install a new vinyl garage door if you’re looking to update the entire face of your home. When purchasing your siding, buy an extra panel or two for repairs down the road, making sure that you’ll have the right color should the need arise. If you live in an area prone to major windstorms, purchase siding that is rated for hurricane-force winds. Be on the lookout for moisture buildup under the siding which may occur over time, as this can lead to rotting, mold and leakage. If you eventually want to change the color of your vinyl siding, use paint which is designed to stick to plastic surfaces. Expect to recoup about 75 percent of vinyl siding costs when you sell your house. Is A Rain Chain Right for Your Home?